The Press Kit. Probably one of the most important things that need to be created for your book to achieve success (besides the book itself). I will be going through the ins and outs of creating one in this post. But first, what is a Press Kit and why do you need one? -> A press kit is a succinct and compact kit that provides media sources with all the details they would ever need to know about your up and coming bestseller. It will provide more information about you, your book, and the specifics of everything book wise. -> In the age of increased competition for books, its essential to have one. Not having one will result in dismal sales and overall the flop of your book and most likely your ambition to write more. To show the validity of your novel and also it will serve as a great piece of marketing literature for anything you want to do later on in promoting your novel. So, what is in a Media Press Kit? -> A few things. (A) A Cover Letter, (B) Press Release, (C) Author Biography, (D) Photograph of yourself, (E) Spec Sheet, (F) Order Form, (G) Writing Reviews, (H) Business Cards, (I) Question and Answer Sheet), (J), Mock Book Review, (K) A COPY OF YOUR BOOK!!! -> Should be brief and enticing. In this, tell what the book is about, when the publication date is, and why it is of interest to each specific person’s audience you are sending it to. Explain any promotional and advertising plans. Do you have any special qualifications as an author? List them! Make sure you start off with a riveting opening line so that it hooks the attention. Like resume cover letters, there is a general template for creating this. Here is what I did. 1st paragraph = selling your story. 2nd paragraph = What are your goals in writing your piece? Who are you planning on attracting with your book? Hit those audience demographics. 3rd paragraph = When is publication? Where is book launch party? What are you doing for marketing with it? Do you have a book tour established? All these questions should be answered here. 4th paragraph = Prompt them to return the form you should have included with your kit. This will weed out the people who want the book and who don’t. Also, it should save money on shipping out books for them not to be read. -> It should be no longer than 2 pages double-spaced. But, the shorter the better. You want to create a buzz about your fiction by creating an interest gathering headline, a little bit about you, and a little bit about your book. You may also want to tell a little story about how you came up with the idea for your story. -> At top or bottom of page list the specs of the book (title of book, name of author, cost, amount of pages, ISBN, contact information including phone and email, website address) I did this in using a table in microsoft office word. -> It may also be a good idea to include the back-cover blurb in this. Tell them why your book is essential for them to review and buy. You need to have a point of difference! What is your book’s PoD? There should be something here, how else can you separate yourself from the competition. Expand on this in here as well. End with a paragraph on how they can reach you and a link to your website so you can start driving traffic there. -> Okay, so you can decide to do all of these things separately. However, I highly recommend you create a fiction author brochure and you include all of C-G (mentioned above) in it. Here’s how you do it. I did a tri-fold. So a tri-fold has 6 total pages. Let’s go through each one of them. -> 1st page = cover of the book. Name of publishing company (if you created one). List your website address. -> 2nd Page = Back cover blurb of the book. Also, depending on how much space you have left after this, I included my spec sheet again. So here is where I would talk about pricing, trim size, page count for softcover and hardcover if you know that all. Publication date. Publisher. Distributor. -> 3rd Page = Author biography and below it your Author Profile Pic. That should take up the whole page. Now, what should you include in the biography? Well, whatever you plan on putting at the end of your book but somethings you could touch on is what kind of things you are involved in (are you involved in any writing circles? ), have you done anything remarkable, also the last sentence should look something like this “To stay in touch with Michael and receive updates and exclusion content not featured elsewhere, signup at (website stuff in here). And don’t forget to follow him on twitter at www.twitter.com/michaelethies” This will help build up your twitter following, Facebook following, whatever social media you plan on putting at the end of the sentence. But, it’s a call of action. And it’s very powerful if done right. -> 4th page (rightmost side of inside of brochure) = Order form. Put a check box here with a few options for the person to check off and return to you. Have check boxes next to each of these below. * We expect to review this book in: ___________ on Approximately: ________________, 20___. * We are considering stocking/adopting this title. * Please send a photo of the book. * Please send a photo of the author. * Sorry, we didn’t find this book suitable for our needs. After that include a place for them to write in their name, their occupation title, where they work, their email, and their complete address. Also, have at the bottom the address where you will be receiving all of your publication information so that you can keep in contact with them. -> 5th page (leftmost backside page) = Leave blank. There is no point to have anything on this page because they will be ripping it off and sending it back to you. If you did want something to put in here when you get more book reviews that will fill up your last page (the back cover) then put in a variety of ways that someone can help you promote your book. Here is what I put! “It would be a fantastic help if you could utilize some of these suggestions to help promote the book. -> 6th page (last panel) = Writing reviews. Get some reviews from your friends, get reviews from teachers, anyone! This will start out small, but as soon as you get more you can keep updating this. So the very first things people will see when they get this brochure will be the Cover Photo and Reviews about your book. PERFECT!!! -> If you don’t have some made, make some up for yourself and your book. If you have a publishing company like me, then make some with your logo and publishing company info on it. Otherwise, if it’s just you and the book, provide the cover image of your book (if applicable) but definitely your contact info and try to make it look as professional as possible. -> What do you need this for? So that they already have the answers to some of the questions they would need to ask you to publish anything about you. The people you are trying to reach are very busy. So, be courteous and have all of these questions already answered for them. They don’t have time to actually interview you. With that being said, here are the questions you should answer. 1) Why did you write this book? 2) How did you become interested in the topic? 3) What did you hope to accomplish by publishing your book? 4) Who is your intended readership? 5) When did you realize you wanted to be a writer? 6) How did you research your book? 7) What surprised you about the process of writing your book? 9) Are you working on another book? -> This is simply a book review that you write. Many reviews are too busy to read your book carefully. So a mock review helps them out. So they can simply just take some passages from it and use that. -> Pretty self explanatory but yeah, just make sure you have a copy of your book along with it. What that order form is doing up above is making sure you get advanced notice of any reviews coming your way so that you can look for them. It is not an order form saying, “Oh I want to review this book” You can screen out and qualify people through the sending of PDF formatted Galley Copies and save the hard galley copies for the “important” reviewers, the ones with more reach than the others. This will cut down on expenses. Alright, and there you have it. Your own media press kit. Good luck in creating it. Have fun with it to. It’s a blast and a nice project. If you have questions leave a comment and I will try to answer them as promptly as I can. The Trials of the Core. This is the finalized cover for the first book in my novel, The Trials of the Core. 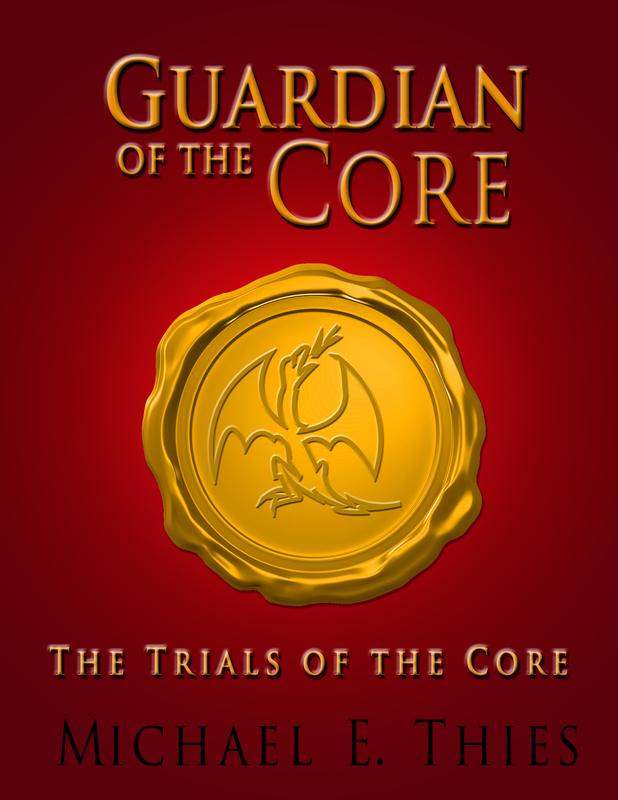 You can follow along with the story on Goodreads (https://www.goodreads.com/story/show/340850-guardian-of-the-core) or on Wattpad (http://www.wattpad.com/story/7133539-the-trials-of-the-core). Although this post will not be anything novel and original, I do want to reiterate this because it is something that I am doing currently through my pre-marketing strategies (which if you’ve read my other posts should be around 3 – 4 months prior to your books release). The strategy? Well, its releasing your novel piece by piece and week by week hopefully. Now, like I said before, many authors already currently do this, and that is good because it really does build a large readership and sorry to say folks, it’s usually not the first book that makes you money, it’s the second and the third and so on. The first book is just to establish yourself as a recognized author and to slice out a pie in that saturated author market. It’s about building up your fan base. With that being said, though, here are a four options that you can do while trying to build readership (although I’m sure there are probably lots more available). Here on GoodReads you can make an author profile for yourself once you have a few basic things taken care of with your book (like an isbn being the most important) because they offer their author program to those who are published, yes, but also who are in the process of publishing, so start building that readership today. I have just started this, and am posting chapters weekly for people to read. I don’t believe this one is as well known, at least I never heard of it until very recently, but it has worked wonders for authors. Wattpad is an online writing community site and app where people can visit and either read free stories or post them. It’s sort of like a YouTube for writers. Anyone can join (it’s free!) and writers can post poetry, short stories, full-length novels, screenplays—pretty much anything writing-related—and other users can read them, comment, share, vote, etc. It’s the number one app of its kind in the world and has about 10 million+ unique visitors a month. The same tactic I mentioned above about utilizing a weekly post will go good with this, too. I highly recommend it. The more visibility the better. Have you considered that blog of yours as a potential option for sharing tidbits of your story? If not, you should. I have been going back and forth about this decision myself just because I have been so busy but I think I’ll probably end up going with it in the near future. And even if you don’t post chapters of your novel, perhaps just doing a weekly blogpost like “motivational mondays” where you say your favorite quote or something. That’s always a good way to build readership and eventually you’ll get people looking forward to what is the next thing you’ll post. Twitter, some have said, is online poetry. It restricts the user to only using a certain amount of characters and that’s it. Well, although you can’t post a whole chapter on Twitter, why don’t we utilize a new approach? Have you ever written something in your story and you’re like “Damn, that is good writing.” I have. Or, at least I like to think I have. And I wish every single sentence could be like it. It are these gems, though, that you could put as part of a weekly Tweet that either is separate from the novel chapters you are posting, or coincides along with them. For example, I am doing mine on Sunday as part of my “Quotetastic Sundays” (I know, not the most catchy or original thing), but one of my characters in my fantasy story gave really solid, intriguing, and thoughtful advice. He said, “Warriors still standing do not stand still.” I personally really like that line so I decide to Tweet it out as #newauthor #GoC (guardian of core, series of my book) #fantasy. Any hashtags that will get me found pretty much. Anyways, I plan on utilizing a lot more of these awesome lines and advice in the near future. –> The problem I think many of us will have with this is where do I stop it? Should I give the ending away? Really, I think it is your own call there. I would say go for it, because here’s the thing, if it’s good writing, and people like your story, they will buy it regardless of it is online for them to read. Why? 2 reasons (although there are probably more): (1) You didn’t make it easily accessible, you spread it out over weeks and months. (2) Reading online blows!!! It tires the eyes much faster than e-books on kindles or nooks, or the printed versions. Although I’ve been posting lots of stuff about good marketing strategies and how to get your book known, there is one that I haven’t yet and that’s because it should be a fundamental idea that all authors live with. Good, quality writing will attract fans. There is hardly any time where bad writing will garner a lot of sales because so many of us live on reviews of books nowadays. If you want to be a successful author, first and foremost, put out a good book. I recently came across this amazing image and although it is more for small businesses I think any independent publisher who has their own house is a small business owner. More realistically, though, for those of you who have not set up something like that, then this may be relevant for the types of things that will get your book noticed. It breaks it down by “Time” spent and “Money” spent and what is going to cost more in either category. Genius, really. To see the explanation for each of these options click on this link here: https://getlisted.org/static/resources/digital-marketing-options.html This will help you when you need to start thinking about visibility for your book. That’s all for now. I will try to get some more info up about creating the press kit for your book, but my schedule is very hectic, too 🙁 Look back for more updates later! Also, I hope to reveal the logo for my publishing house sometime later this week (the graphic designer told me it’d be done). So, be excited for that. First, request the appropriate amount of galley copies to start sending off to people who will review your book before it comes out. No one wants to review a book afterwards 🙁 Sad truth, but the truth nonetheless. So, when your main book is getting printed, make sure that whatever source you are going through for your book also gets galley copies to you. If they don’t offer them, then perhaps go with a local print store or 48-hour books is another good option. This is when you want to send stuff off to Publisher’s Weekly and other good national magazines.